Liner notes: Supported by a funk groove of organ and tambourine, Frankie Pighee, a 400-pound woman with a voice deeper than many men’s, salutes R&B greats Wilson Pickett and Sam & Dave on this 1967 single from the obscure Soul Kitchen label. 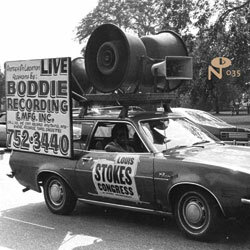 Behind the music: From the late ’50s to the late ’80s, the low-fi studio of the tiny Boddie Recording Company was responsible for nearly 300 albums and singles, most of which sold fewer than 1,000 copies. Heavy on soul with a side order of gospel, this fascinating archaeological study collects 58 tracks on three CDs. Check it out if you like: Alvin Cash, The Velvelettes, Bessie Banks, and other underappreciated ’60s R&B figures.